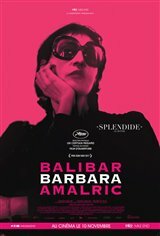 A renowned actress with a deep voice and a slender figure, Brigitte is hired by filmmaker Yvan Zand to play Barbara in a film about the life of the legendary French singer and songwriter, who died in 1997. Conscientious, the actress polishes her vocal performances and integrates the tics and mannerisms of her model. During filming, however, Brigitte begins to question Yvan’s true motives.